The Davies Condos, 36 residences and 8 penthouses (located at 281 Avenue Rd) presented by Brandy Lane Homes. Giving luxury a new meaning the Davies condos has everything you need. 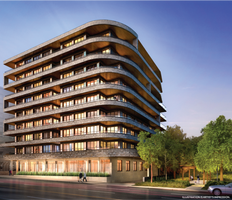 Located between Summerhill and Casa Loma, this will be a premier residence. The Davies Condos will be just north of Yorkville, an attractive location for those looking to be close to Toronto's greatest shopping, restaurants and nightlife. Standing at 9 storeys tall, the Davies Condos contains plenty of green space, parks and great views of Toronto that no one can resist. Suites are starting at 1064 sq ft, and priced from the $700,000's. Features include private elevators, gas fireplaces, Bosch appliances, and Cameo kitchens. The Davies – 'Liveable luxury on the park'.